Rituals, Routines and Religion – Think…Feel…Be….BodyWise! My morning ritual is one that I especially look forward to: rise, eat banana, make coffee; sip coffee; read my devotions; be quiet…listen…wonder…listen…pray…jot down the ideas or inspirations that have been piqued during my morning quiet time. I will write about these things; I will think about these things as I prepare for the new day. So now you know my morning ritual…for waking up and for making a connection with the Divine One. Now I’m ready for my morning exercise routine; I’ll have some toast or half a bagel and get ready to go for my morning run. On Monday, Wednesday and Fridays I head out the door for a 3 to 8 mile run, depending on the schedule for the day. On Tuesdays and Thursdays I put on my Zumba fitness garb and lead an hour long group fitness class. Saturday or Sundays are reserved for long runs of 8 to 10 miles or a mountain bike ride with my husband. My exercise routine is so well entrenched in my body and on my calendar that I feel completely out of sync when I miss a morning run or class. But that’s the value of having and using rituals and routines. They help us stay connected and in touch with those activities that are important for us to do every day. Do these things long enough and they become a part of you, of your subconscious. However, rituals and routines do have their downsides. Rather than keeping us on track, they can become a source of great boredom for us…in other words we can feel stuck in a rut by the very routine that once gave a us a firm sense of being or accomplishment. If I ever feel stuck or bored in my routines, then I know they have outlived their purpose. It’s time to recycle or reinvent a system that will continue to propel me in a positive, forward frame of mind and/or way of going. We should not hold a ‘religious’ attachment to rituals and routines. Even though their very existence in our daily life provides a semblance of structure, this framework should not be allowed to solidify if it is no longer useful for its original purpose. If our rituals and routines fail to motivate us to engage in the desired behaviors or actions for which we initially employed them, then it’s likely that they have become a religion of tired belief rather than a reflex of purposeful action. 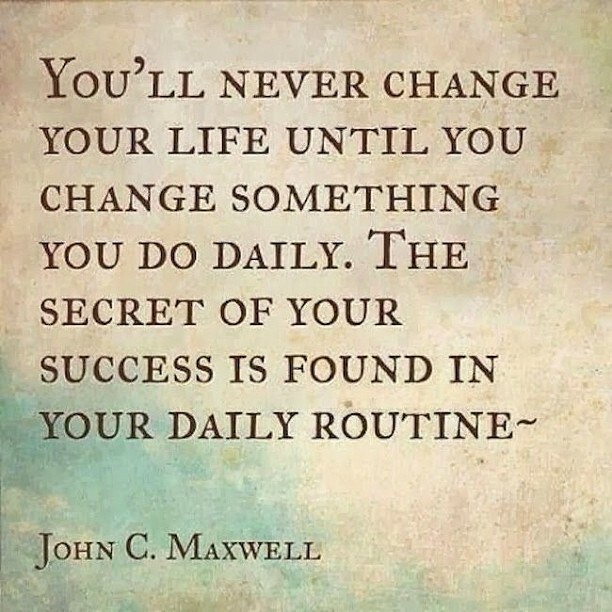 Are your rituals and routines working for you? If not, don’t be afraid to change things up for yourself. Your creativity, your fitness, your personal goals or spirituality can only improve when you reset your rituals and routines.